From time to time, we produce Seasonal Guides (with Garden highlights) – click here for current editions. 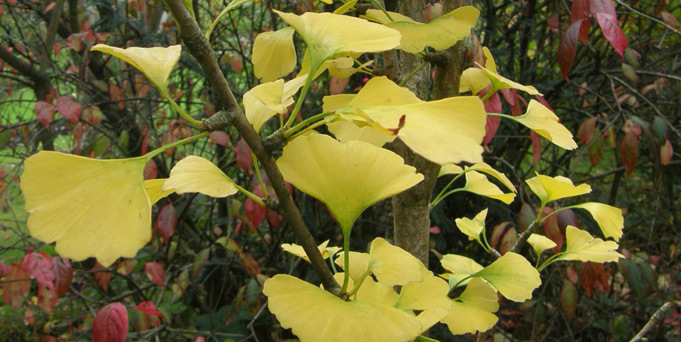 There are many interesting trees, including Sweet Gum, Lawson’s Cypress, Hemlock, Japanese Cherry, both Contorted and Woolly Willow, a Maidenhair tree (Ginkgo biloba), Paper Bark Maple (Acer griseum). We also have a rare Catalina Ironwood (Lyonothamnus floribundus var. aspleniifolius), a single species evergreen tree, located between the Hot House and the Reception. The flower bed opposite the orchard is dominated by species native to New Zealand including the N Z Cabbage Palm (Cordyline australis), Griselina littoralis and a variety of Hebes including H. ’Midsummer Beauty’ and H. ‘Carl Teschner’. Continuing the antipodean theme, we have a Kiwi Fruit over the reception bearing plentiful fruit over the summer. The gardens are located on a predominately clay soil which benefits from regular additions of organic matter. Grit and sand are also incorporated to increase drainage. An alkaline bed has been created using chalk and lime. This allows us to grow species that would normally not tolerate the clay soil. There is also a Hot House dating back to the origins of Martineau gardens. Take time to visit the Hot House and see the Tree Ferns, Jasmine, Camellia saluenensis, a Swiss Cheese Plant (Monstera deliciosa) together with a wide variety of cacti and succulents. 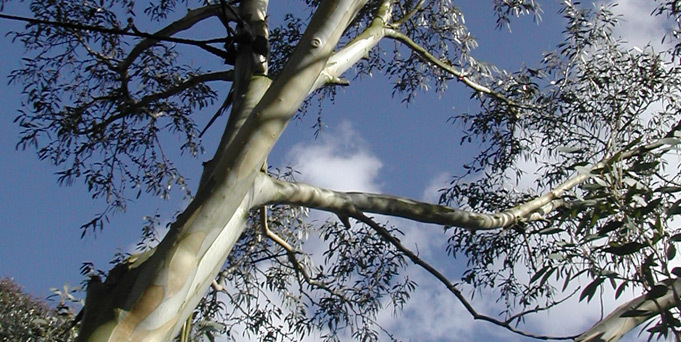 There are many Eucalyptus including E. niphophila commonly known as Snow Gum. 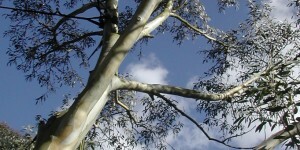 Eucalyptus are fast growing; all these trees are less than 25 years old. We hope you enjoy the gardens and some of the spectacular plants, such as Indian plum or Oso berry and Colletia paradoxa (syn. cruciata) with its fragrant, tubular white flowers in late summer. 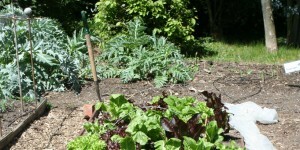 We practise organic gardening by not using any chemicals or artificial products. We make our own compost to provide essential nutrients and use nematodes (a microscopic animal) to combat slugs. The beds, following a four year rotation, are regularly weeded and maintained by the volunteers. We grow a wide range of vegetables – globe artichokes, asparagus and sweet corn, all of which are sold when in season. 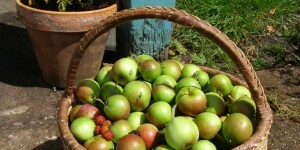 We also make jams and chutneys from the fruit and vegetables. 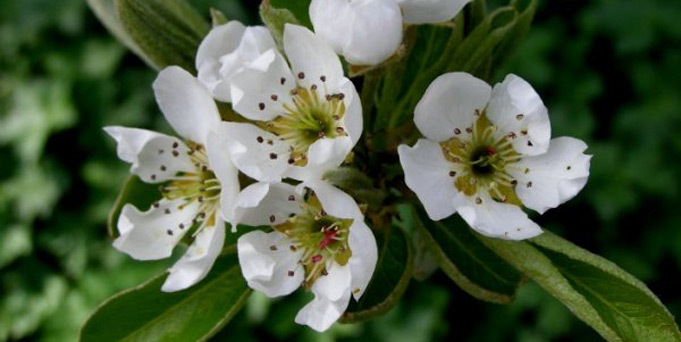 There are over 30 different varieties of fruit tree in the orchard. Spartan, Worcester, Russet, Egremont Russet, Worcester Pearmain, Ellisons Orange, Conference and Williams are some of the apple and pear varieties. There are also Fig (Brown Turkey), Medlar, Morello Cherry, Greengage, Damson and Plum trees all producing plentiful and delicious fruit in the summer. At the centre of the orchard is a magnificent Mulberry (Morus nigra) tree. All trees with a diameter over 35cm were tagged in November 2004 as part of the ‘Welcoming Visitors’ project funded by Living Spaces. Trees in the formal gardens and the wildlife area were surveyed and their details recorded, including the condition and shape of the trunk, branches, roots and canopy. This also gave us the opportunity to identify any work required for health and safety, especially in the wildlife area where branches and a fallen tree were blocking the path. Unfortunately, a Dawn redwood had to be felled, due to honey fungus. A Cobra cable support was required for one of the Eucalyptus trees in the formal gardens to protect one of the trunks for leaning and potentially breaking.